Hibernating for too long when you're a food blogger is like putting food for too long under the warming light... Just not a good thing to do. Ever. But I have a really good excuse. Yes, I said, "Excuse." Pardon me for having a baby! Really - it was quite the feat. I'm proud of me. I'm also proud of my husband, my doctors, nurses and anyone who had to deal with me the past few months. I was no fun, had a bad, limited diet (because OH! Guess who had Gestational Diabetes in December when food really gets good and interesting?!) and was so big, I no longer could sit comfortably in a restaurant's banquette. And I LIKE sitting on the benches instead of a chair -any day. Trust me. I was not a case of misery loves company. I was simply miserable and wanted to be left alone with my really bad sugar-free cookies, decaffeinated beverages and modified Atkin's diet-based existence. It was major suckage. But now it's over. And we're actually venturing out of the apartment -and back into restaurants that have good food rather than be slaves to delivered food from the local sushi or burger joints. 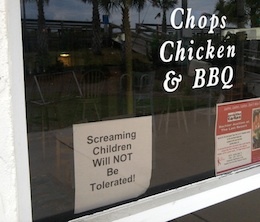 And don't fret: we will continue to dine in good locales in spite of new parenthood. Taking the baby out now and getting him used to haute cuisine and how to behave in some of NYC's finest restaurants is paramount to our very livelihood. I'll tell you about our first adventure to Riverpark very soon. Promise.